The development of the solar polar field strength throughout a solar sunspot cycle can be used to predict the magnitude of the next cycle and the peak of the current cycle. Polar field reversals typically occur within a year of sunspot maximum. It is not uncommon for the northern and southern polar fields to have significant differences in field strength and develop asynchronously over time. The Wilcox Solar Observatory has been collecting solar polar field data since 1975. Non-filtered data can be viewed in this plot. Below you will find a plot where only the filtered (by a 20 nHz lowpass filter) field strength data is displayed. Vertical lines representing field reversals and sunspot cycle min/max have been added to increase the potential usefulness of the plot. The northern polar field changed polarity first in June 2012, then weakened and was near neutral in April 2014. The southern polar field reversed in July 2013. During the previous similar polarity reversal in 1989-1991 the northern polar field reversed 14 months prior to the southern polar field reversal. 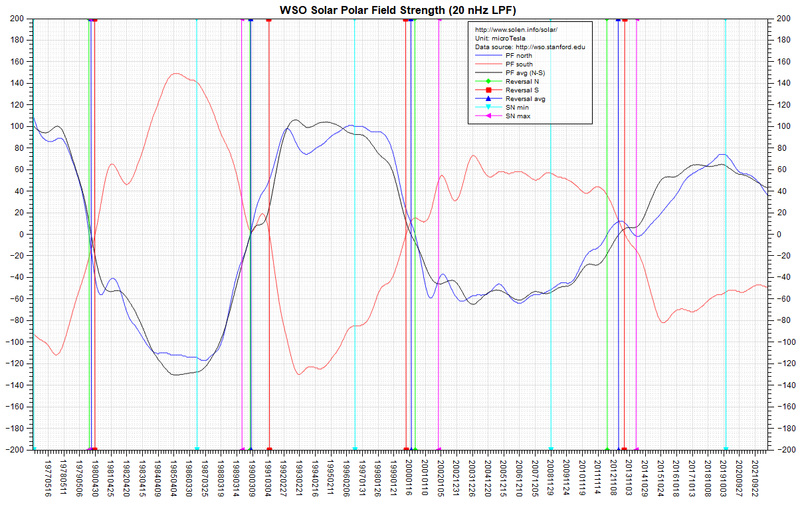 As of April 2019 the strength of the polar fields hints at a cycle 25 with a magnitude similar to that of cycle 24.